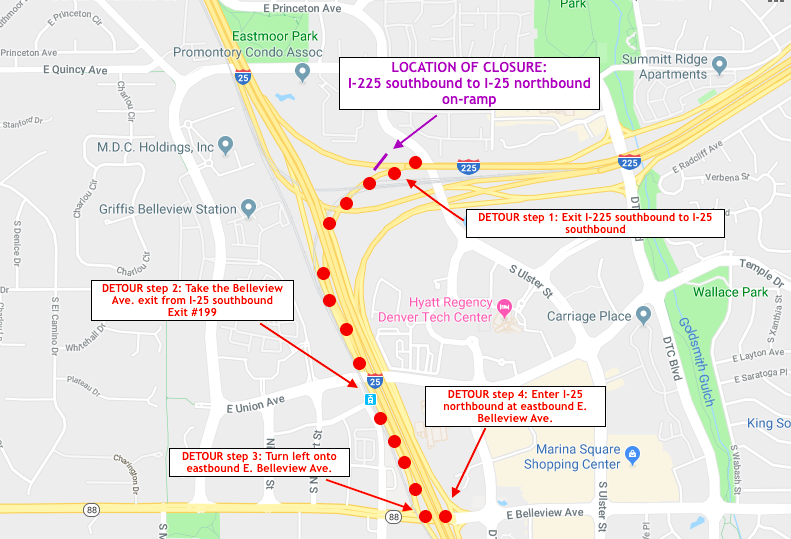 ARAPAHOE COUNTY—From 11 p.m. Sunday, Nov. 11 through 5 a.m. Monday, Nov. 12, crews will close the southbound I-225 on-ramp to northbound I-25 as crews move and set temporary barrier as part of the I-25 Overlay: C-470 to Belleview Avenue project. Work is taking place at night to minimize travel impacts as much as possible with the ramp scheduled to re-open prior to Monday morning rush-hour traffic. Detours will be in place rerouting traffic during the full-ramp closure on Sunday night. 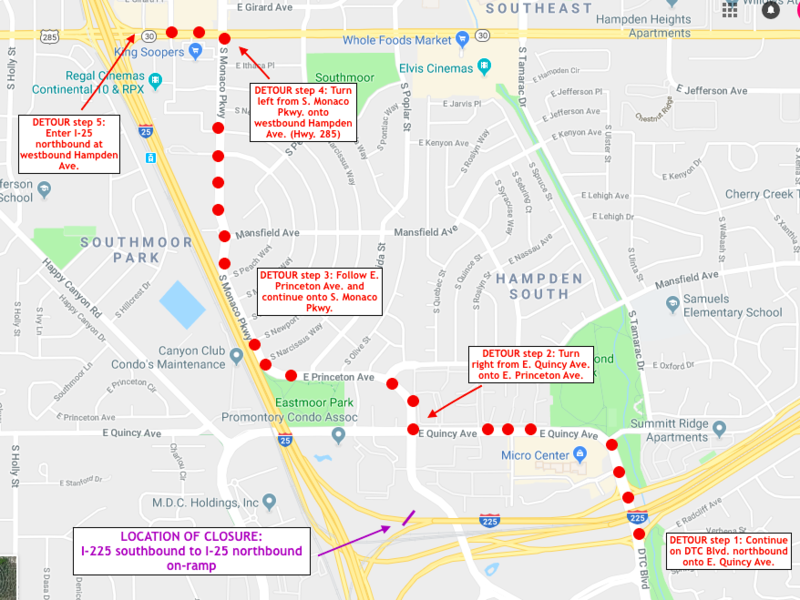 Work on Sunday night will also include grinding operations on northbound and southbound I-25 between Arapahoe Road and C-470. Various lane closures will be taking place in the project zone during work hours. 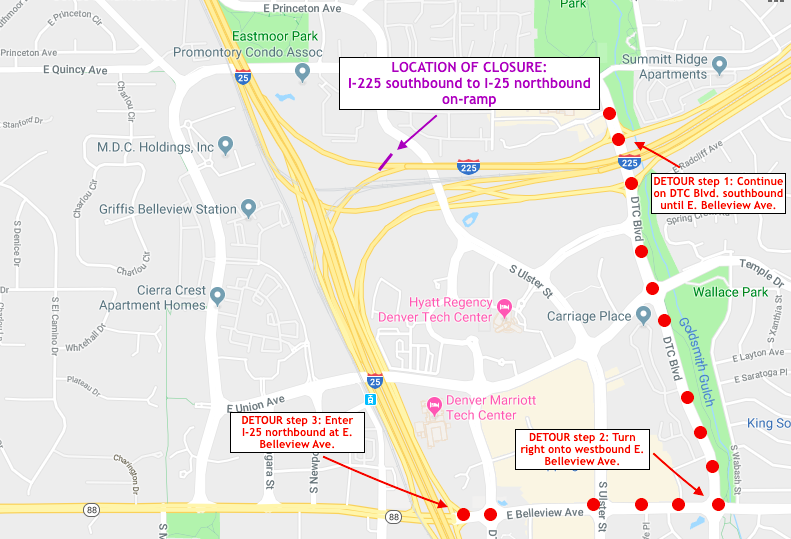 Since April, crews have been conducting bridge deck and median barrier repairs and milling and paving on I-25 between C-470 and Belleview Avenue. Work is expected to last through winter 2018 on this project. The work will extend the life of the pavement and provide motorists with a smoother and safer ride. Motorists should expect various lane closures on northbound and southbound I-25 during work hours on this project. Typical hours will be between 8 p.m. and 5:30 a.m. Sunday through Thursday. Weekend work may occur as needed. There will be a speed reduction through the project zone to 55 mph during work hours.